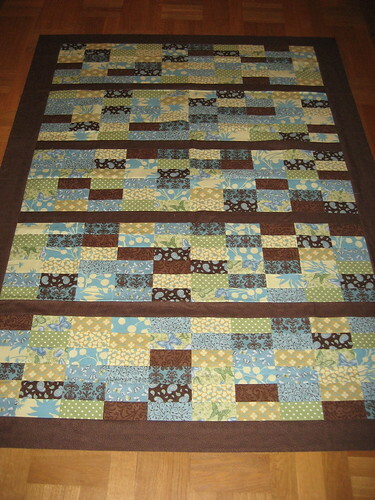 Two years ago, in July 2008, I started working on a quilt for our couch. I bought a pack of fat quarters on a whim as I fell in love in love with the colours and patterns. When I came home I found that four other fat quarters I had matched perfectly. And I started a quilt. And then last weekend I visited a quilt show and was sooo inspired to finish my quilt. I do happen to love the top I’ve made and I have wished for a comfy blanket to wrap around me on the couch when I take a nap or watch tv. Or sit there knitting. I made the quilt’s back the weekend. I changed the layout. 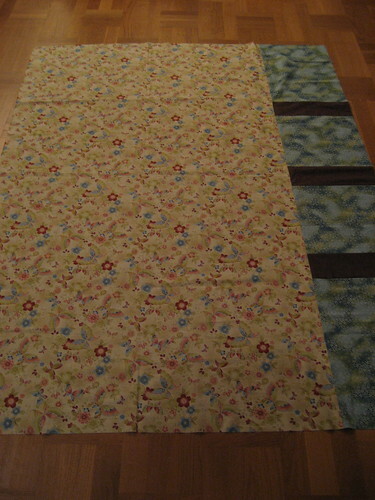 And I cut some fabric from the quilt top’s border to make it match the size of the back. This entry was posted in Creative, Sewing and tagged butterfly, creative, fabric, quilt, sewing. Bookmark the permalink.